Home Sea Island Living Did You Know? Terry Wiggins has been with Sea Island for 36 years. 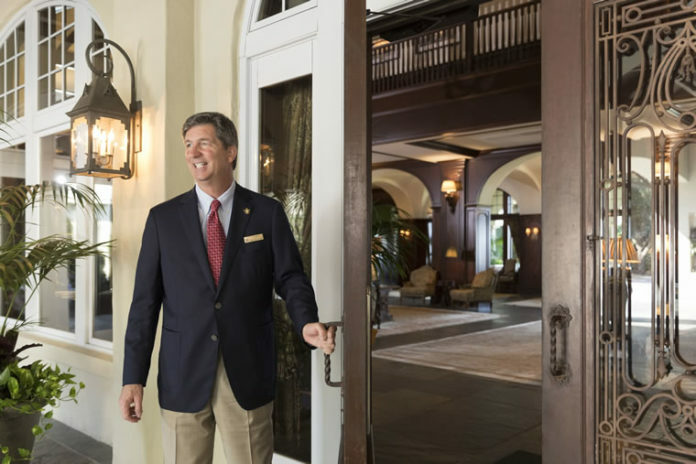 A longtime Sea Island employee, Terry Wiggins, shares some of his memorable experiences at the resort and touches on the meaning of Southern hospitality. Rooms Manager Terry Wiggins has worked at Sea Island since the 1980s, but his connection to the Golden Isles started much earlier. Wiggins was born and raised on St. Simons Island, a mere block from the beach. “I knew from an early age that I didn’t ever want to move anywhere else,” he says. Wiggins worked as a doorman, a bell captain, guest services manager/transportation manager, hotel manager and front office manager prior to his current role at The Lodge. Numerous family members, from three of his grandparents to his parents and brother, have also held positions at Sea Island, employed in the flower shop, assisting with landscaping, engineering and more. As rooms manager, Wiggins runs all front-of-house operations at The Lodge and manages housekeeping. Outside of work, Wiggins enjoys golfing (and taking his dog for rides in the golf cart), going to the beach, riding bikes and spending time with his wife, children and grandchildren, some of whom also have connections to the resort: He and his wife first met at The Cloister—the two have been married for over 26 years—and his youngest son works for the golf department during school breaks. Sea Island Life: What do you find most rewarding about your role at Sea Island? Terry Wiggins: As I drive down the Avenue of Oaks each day heading to work, I never forget how special it is to have been a part of this company [for] as long as I have. … As with any job, you will have challenges, but making people happy and satisfied is what I find the most rewarding. SIL: What does Southern hospitality mean to you? TW: Growing up in the South, I know this is not just a catchphrase—and there is no doubt [that] we use Southern hospitality every day at Sea Island. We welcome our guests with open arms and, sometimes, great big hugs. Being polite and kind while helping guests and each other with charm is the pure essence of Southern hospitality. SIL: What is the most memorable experience that you have had at the resort? TW: I would have to say the G8 Summit in 2004 is right at the top of the list. To have many world leaders here at one time was an experience of a lifetime, especially since we were in the process of building the new Cloister. I was guest services manager at the time and the most fun I had was when [I was] asked by the Secret Service to have a team of bellmen ready to unload President Bush’s helicopter when it landed. 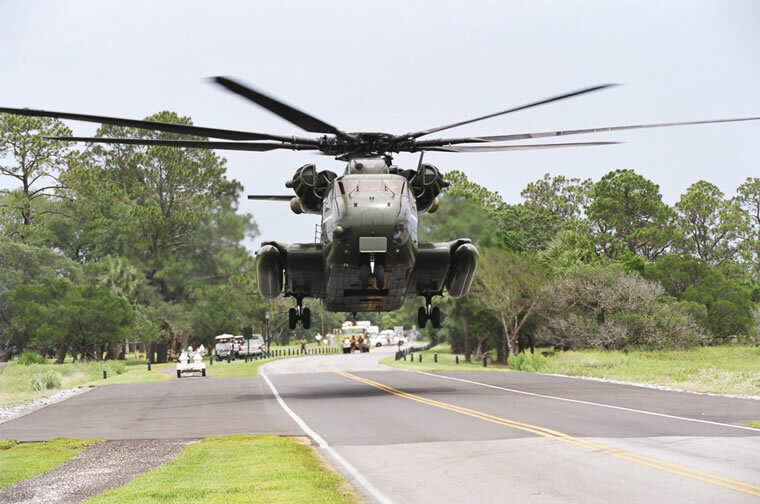 Little did we know the helicopter was going to land on the Sea Island causeway, just before the bridge. We were right in place when the president came off. As we entered the huge helicopter and unloaded what seemed to be an endless supply, the chopper pilots never turned their engines off. The heat and the noise from the engines and blades were incredible. Wiggins helped unload President Bush’s helicopter during the 2004 G8 Summit. SIL: What makes Sea Island so special? TW: Its rich history, involvement in the community, location and having a one-of-a-kind resort is what attracts so many influential guests and residents to our community. From the very minute first-time visitors approach the Island and see the marsh, ocean and majestic oaks, they are wowed with excitement and pleasure that they want to experience again and again. SIL: If you weren’t at Sea Island, what career would you have wanted to pursue? TW: I used to say I wanted to be a lawyer or a pilot like my uncle before I started my Sea Island career. However, this company has been the right fit for me for a long time and I don’t regret a minute of it. A lot of people can’t believe it when I let them know how long I have been with the company and say how rare this is. But I know time travels fast, and it really isn’t that rare at Sea Island. … I really couldn’t imagine being anywhere else. SIL: What are your plans for the future? TW: My plans are to continue with The Lodge as the rooms manager and be a part of its exciting future. We have 14 new sleeping rooms in six new cottages, a pool and pool house that will be open and ready for guests in November, just in time for the RSM Classic golf tournament.